Arms Keep Falling Asleep – Why? If your arms keep falling asleep, you need not get alarmed as it is quite a common problem. It arises at any moment, but it is more common when you are resting. Usually, you will feel a tingle in your arms or legs and then you will not be able to move them. If you sleep or sit for a long period of time, you are likely to feel this tingling sensation as you try to change positions or stand up. It is probably the major reason for your arms falling asleep. Poor circulation may happen when you sleep in a wrong position which causes pressure on you arm, disrupting the blood flow and nerve pathways to the compressed area. In this condition, your arm may not be able to send the proper signals to the brain and will only improve when blood flow gets back to normal. A stroke occurs when blood does not get to the brain. This can be as a result of hemorrhage off the cerebral artery or blockage of the vessel that supplies blood to the brain. It is reported that most stroke cases occur during the night when one is asleep. The major symptom of a stroke is a tingly feeling of numbness on one side of the body. You will also experience headache, disorientation, difficulty in speech and understanding conversation. If you experience arms falling asleep when you wake up, check for other stroke symptoms. If you experience any, call for immediate medical help. The ulnar nerve stretches from beneath the collarbone all the way to your arm. If the nerve is compressed, your hand will experience numbness, and it will stop functioning as it should. Sleeping with a bent elbow for long causes you to exert pressure on the ulnar nerve, and in the worst case scenario you will get ulnar nerve entrapment. Consequently, you will wake up with arms falling asleep. 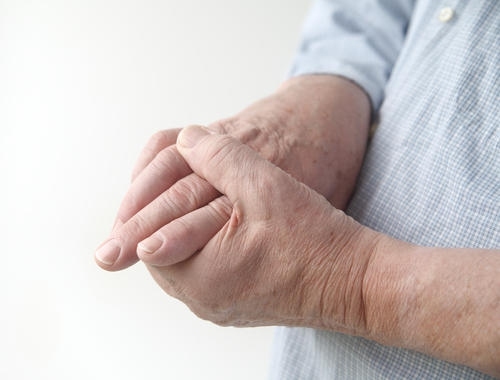 Knowing the cause of the problem is not easy, but some people get swollen elbows, which might also be a result of other conditions like arthritis and bone spurs. When there is pressure on the nerve that is located on your wrist joint, you are likely to feel a tingling sensation on your arms especially in the morning. Activities which require a lot of repetition such as typing, painting, carpentry, piano playing and racket sports could lead to this condition. Feet, hands and arms might fall asleep as a result of diabetes as it is a common cause for peripheral neuropathy, which may lead to symptoms first appear in feet that will gradually go up to affect both hands and arms. The falling asleep can happen at any time even when you are relaxed and awake like when working on the computer. If you have arthritis or you have recently had surgery done on your arm, your nerves might be damaged or irritated resulting in arms falling asleep. Toxins like arsenic, lead, mercury, thallium, etc. Your sleeping position contributes greatly to arms falling asleep. Having your arm support the weight of your body as you sleep could be problematic. Instead, avoid sleeping on your arm or putting your hands under your head. You can also experience the problem if you let your hand hang off the bed as you sleep. Movements will cure arms falling asleep. Keeping your arms at the same point for a long period will result in arms falling asleep. Instead, make sure that you sit upright and make movements at intervals. If you are doing a task that has repetitive motion like clicking the mouse, typing, and knitting, it is wise to take a break. You can do rotation exercise with your shoulders and wrists. When you engage in physical exercises like swimming, walking and jogging on a daily basis, your circulation will be improved. This will kill the problem of arms falling asleep when you stay immobile for too long as well as when you are asleep. If you want quick relief from arms falling asleep, just dip your arm in hot or cold water in a tub or just wrap it in a hot or cold towel. This will open up your blood vessels and improve circulation. Anti-inflammatory drugs can provide some relief for the numbness and pain along with arms falling asleep. If the pain is really serious, your doctor may administer corticosteroid injections to relive the pain while improving you mobility at the same time. If poor circulation were the cause, medicines that help to reduce constriction and dissolve blood clots may be prescribed to increase blood flow and improve circulation. It is highly recommended that you visit your doctor to make sure what might be the exact cause of your arms falling asleep and arrange the proper treatment to prevent the condition from getting worse. Normally, the treatment will depend on the exact cause of your condition. For example, if you have diabetes, then a proper diet and medications will help you to keep a healthy blood sugar levels. While a nerve damage that is really serious may require a surgery to get rid of the condition. Avoid sleeping on your arm directly. This cuts off the circulation. Try taking ginger tea to improve blood circulation. Do physical exercise that will strengthen your neck, shoulders as well as your arms. Use soft pillows as well as a knee pillow and sleep on your back. When you sleep on the side, there are chances of your arms falling asleep while under the pillow. Place your hands above your heart to help them wake up.